On Friday, 2nd June, Emirates Team New Zealand became the first team to stay up on the foils around the entire racecourse. After coming very close in their first race of the day, they finally achieved 100% flytime in their race against Groupama Team France. It was no surprise that the Kiwis were the first, having been remarkably smooth and efficient in their maneuvers since day one. A whimper from a thoroughly defeated Oracle Team USA who simply could not rise to the occasion. As I have always said, a little bit of extra boat speed can make you look like a tactical genius and Emirates Team New Zealand had boat speed to burn. ETNZ could sail deeper downwind and higher upwind while maintaining the same speed as OTUSA and that, my friends, is how you win boat races. How the team was preparing after the disappointment of 2013. This is their story of redemption. So let’s congratulate Peter Burling and his team. They did a fine job and are deserved winners of the America’s Cup, but just a quick little aside. The next time I hear a commentator refer to Mr Burling as the “young” Peter Burling there will be some blood letting. Ferchristsake Horatio Nelson was just 20 when he took on his first command of the Royal navy. Last week I wrote a piece about ETNZ secret potion being an intense National Pride, but I was wrong. Their secret ingredient was the man not at the helm of the boat, but at the helm of the entire operation and I am talking about my old mate Grant Dalton, or Dalts as most people call him. Photo credit Onne van der Wal. We raced together in the 81/81 Whitbread Round the Race, not on the same boat, but all of us racing back in those days were a merry band of brothers. Dalts was a tousled haired, mustachioed, unassuming person who was quick with a laugh and even quicker with a beer. I had no idea that he would rise to become one of the most powerful people in sailing and I am guessing that he also had no idea how successful his career would be, but maybe I am wrong. Dalton’s career was for a long time in the shadow of Peter Blake, the Kiwi superstar who captured the imagination of the New Zealand public by winning the Whitbread and the America’s Cup. Blake was tall and smooth; Dalton not so much and definitely not smooth. Blake was knighted for his contribution to sailing. Let’s see if the Queen nods in the direction of Dalton who surely deserves it, but I think that some of his public comments over the years may disqualify him. Dalton was never politically correct and he certainly had firm opinions on some issues. I am thinking of one comment leveled toward the first ever all-female team to race in the Whitbread. It was the 89/90 Whitbread when Tracy Edwards led her crew aboard Maiden. Dalton famously stated that if an all-female team ever won a leg of the Whitbread he would shove a pineapple up his arse and walk down Queen Street, the main street in Auckland. Edwards won the second leg of that race into Fremantle, Australia and to this day none of us is sure whether Dalton kept his word on that one or not. At the heart of every successful effort you need strong leadership and Grant Dalton has provided the absolute best kind of leadership. He leads from the front and inspires by example. 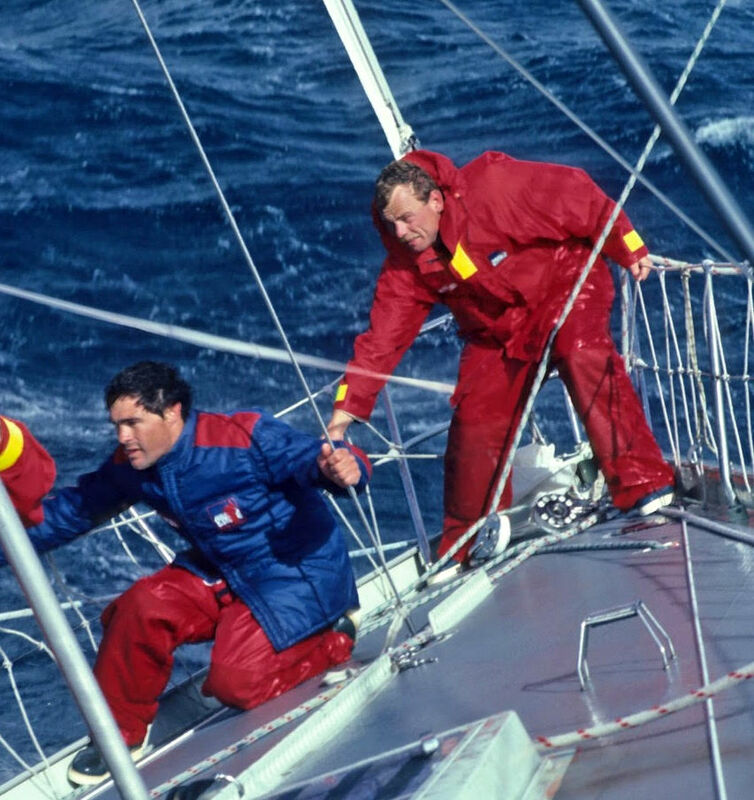 It took him four attempts, two as crew and two as skipper, before he won the Volvo Ocean Race, but in the 1993/94 race he dominated aboard New Zealand Endeavour winning three of the six legs and taking the overall win. He went on to race in three more Volvo Ocean Races before hanging up his oilies and turning his eye toward the America’s Cup. Dalton led the charge to win the Cup in San Francisco in 2013 and we all know how that ended, but what most don’t know was how close the whole operation came to closing down after that loss. Much of their backing comes from the New Zealand government and with such a dramatic loss the NZ public were rightfully less interested in chucking piles of money their way. But Dalton is nothing if not a scrapper. In 2015 he chose to axe helmsman Dean Barker and replace him with Peter Burling, a move that at the time had many calling for Dalton himself to be fired but let’s admit it, in hindsight, it was pure genius. It also didn’t help Team New Zealand when Bermuda was announced as the host of the upcoming AC. New Zealand viewed Bermuda as a commercial wasteland. Through it all Grant Dalton managed to keep it together and the rest, as they say, is history. So I was very happy when Emirates Team New Zealand closed out the Cup yesterday and I was even more pleased to see Dalton on board one of the most sophisticated sailboats in the world wearing a pair of flip flops, or jandals as the Kiwis like to call them. My kind of guy and let’s hope that the Queen can forgive him for a few of his less than noble comments over the years.